Sit down to antipasti like Mozzarella in Carozza (fried cheese pockets) and Bruschetta con Insalata Tropeana (grilled bread topped with tomatoes, olives, and capers). Pasta, gnocchi, and couscous burst with flavors such as prosciutto, sundried tomatoes, and Pecorino Romano cheese. Recipes for calamari, mussels, swordfish, and more teem with the fresh taste of the Mediterranean. No Italian journey would be complete without pizza. From the classic Pizza Margherita to Pizza alla Tropea, topped with sweet onions and anchovies, each region has its own specialty. Molise’s famous Taralli (fennel seed biscuits) and classic Foccacia from Apulia are savory delights that make a perfect snack. Soups, salads, meats, and more offer endless meals and inspiration. To finish your meal, linger over a slice of Torta di Ricotta con Ciliege (ricotta cake with cherries) and sip a glass on limoncello (citrus liqueur). 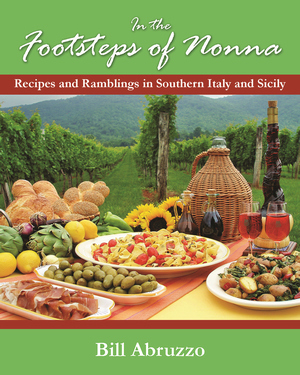 With convivial stories from the hearts and hearths of Southern Italy and Sicily, this cookbook will have a cherished place in your kitchen. Italian American Bill Abruzzo grew up cooking traditional Italian dishes with his parents and grandparents. For the past thirty years, he has traveled frequently to Italy with friends and family, expanding his culinary horizons with every trip. Abruzzo and his wife live on a small farm at the foot of Virginia’s Blue Ridge Mountains, where he grows organic herbs and Italian varietal vegetables. He offers cooking classes and is a personal chef and caterer. Abruzzo offers his own line of specialty Italian foods called il Giardinetto Bello. His products and classes can be found on www.recipesandramblings.com.